We need to talk about N'Golo Kante. Even though a lot has been said about Kante's role under Maurizio Sarri in recent times - too much, in fact, way too much, it's been boring - we still need to talk about it. Because it has not been entirely without merit. As has been regularly explained, the Frenchman isn't playing in the position where he made his name. The position which he, by almost unanimous decree, made himself the best in the world at. So how could Maurizio Sarri be right in sticking to his decision to shunt the World Cup winner further forward? Well, maybe it's because his entire system is predicated on a different kind of player occupying that role, with different responsibilities and a different tempo to set. Maybe it's because he paid £57m to attain a player capable of fulfilling these desires. Or, maybe it's because, even against Tottenham, in hopefully the most unedifying performance of the campaign, Kante still led his side in ball recoveries and interceptions with eight and seven respectively, from that said shunted position. His closest competition for that second category was Cesar Azpilicueta, with three, just for context. So, why is there so much noise surrounding the 27-year-old right now, as opposed to say ​Eden Hazard's goalscoring drought and general lack of form, or Alvaro Morata's travails, or the garish problems at centre back, or Marcos Alonso's confounding ineptness at anything except breaking forward? Well, for one thing, a change in position is the most tangible thing to analyse out of the aforementioned issues. It's there, right in front of you ahead of each game. 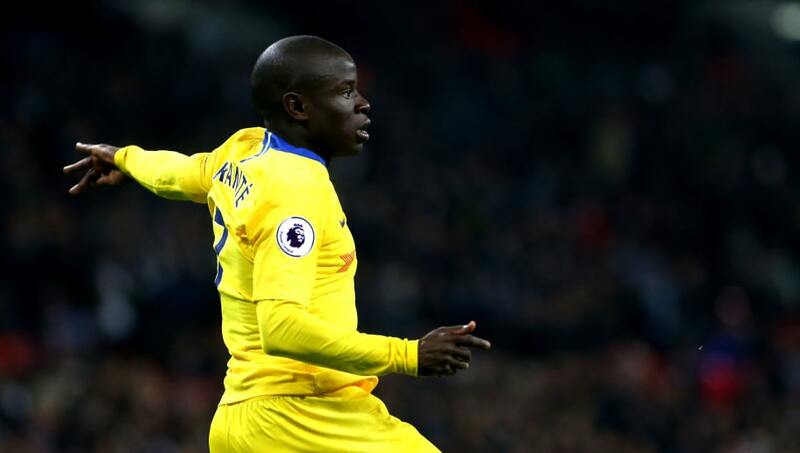 And, paralleled against the enviable body of work that Kante has compiled since his arrival in England, the change in fortunes has been there for all to see. But this discussion, whilst largely either completely missing the point of Sarri's tactical mindset or actively dismissing it, also fails to mention the Frenchman's downturn in form for his national side since the World Cup. That is not to bash him at all, he is worthy of every penny and more that ​Chelsea offered him last week, it's just to say this is not all positional. He has been playing in his vaunted position for France, and has flattered to deceive on occasion, especially in the 2-0 loss to the Netherlands in Rotterdam. As for his function in Sarri-ball, some have suggested attempting to play him in that Jorginho role. To make him that pass-master regista for the team from the base of the midfield, whilst recapturing his all-encompassing defensive duties. Why would you now, after three months of training him up in this 'attacking' role (we'll come back to this), abruptly curtail these teachings in favour of trying an even greater conversion? Sure, he'd make more tackles and more recoveries than the Italian does, and ease the ever-present fears of David Luiz and Antonio Rudiger. But he'd also produce far less opportunities for his side, and potentially cause most of the problems he'd end up solving. Others have called for the 59-year-old to dispense with his 4-3-3 formation altogether, instead opting to play both ​Kante and Jorginho in the holding roles, with Ross Barkley or Mateo Kovacic ahead of them providing the attacking thrust. But that's equally pointless, as it removes the triangles that his vertical tiki taka style relies on, and further isolates his front three from the midfield - which were somewhat starved against Spurs anyway, but ineffectual when they received service. There is a reason Sarri sees Kante's best place in the team on that right side of the midfield, and it's a decision based on defence just as much as it is on attack. Not only can the World Cup winner burst forward with the ball with more verve than most, but he can also use his feted off-ball tenacity and pressing to disrupt things further up the field. As an aside, it's worth pointing out that despite his apparent deficiency going forward, he still has more ​Premier League goals this season than Christian Eriksen and ('he's Kante but much better going forward') Naby Keita. Evidently, this didn't work on Saturday, but a lot of things didn't - including, but not limited to, the synapses in Luiz's brain. His midfield partner Kovacic wasn't all that impressive either, but the perception of him as a solely ball-playing player is completely false. He is industrious and combative, as indeed is the midfield as a whole, when on song. The unbeaten run had papered over the plentiful cracks in this Blues team for far too long, but that doesn't mean Sarri's system is wrong, or that he is stubborn (bordering on foolish) to persevere with it. It just means that it needs more time to develop and foster within this Chelsea team. Following the Spurs result, and the apparent naivety of the team's play, fans have understandably looked ahead at the upcoming clash with Manchester City on December 8th with panic. Some have even plead for a reversion to the more defensive approach of old. It's worth remembering the consequences of these tactics last season in the two clashes with Pep Guardiola's side, the second of which was an embarrassment for the competitiveness of the league. Sarri must stick to his guns with Sarrismo, which includes keeping Kante further forward, to maintain the path of progression he has plotted so far this season. He must continue to fight fire with fire, because that is his why and it was what Chelsea brought him to do, probably after watching that aforementioned game at the Etihad. With all that said, I doubt he's even preoccupied with thoughts about his midfielders right now. It will be what's behind and ahead of them that's most concerning.